This is the XanMigBil (Xander Lopez, Miguel Angelo Sumaya, Billie Joe Posadas) & JamPiaSot (Jamaica Gacuan, Marie Jhoy Terrado, Elyssa Dienice Lansang) cronies. I edited this photo about a year ago. We were first year college here. 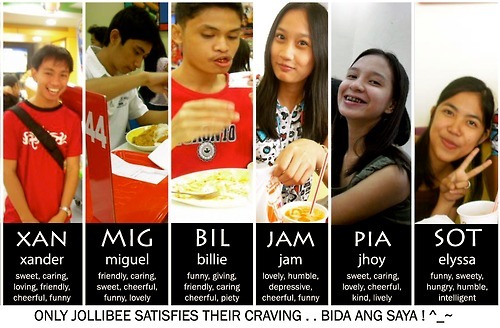 We like to hang-out and eat on our favorite fast food chain which is Jollibee. Now, I wish we would be together again and make another memory, laugh again, hang-out again, eat together. Woah. This entry was posted in Food Corner, People & Events and tagged favorite, food, jollibee. Bookmark the permalink. And, wow. Looking forward to hanging out with you, guys!